Good news for all you mobile broadband lovers. Verizon Wireless today launched its EV-DO Rev. 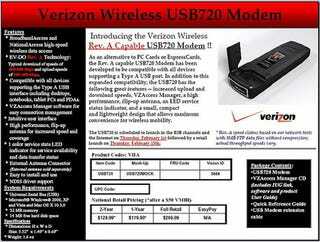 A network along with the USB720 wireless modem ($149 with 2-year plan), which is pretty much what we used back during CES. The modem combined with the speedier network will give you download speeds of around 450-800 kilobits per second. If you've got the cash (or your company has the cash), we say go for it. The best part, it plays nice with Windows and Macs straight outta the box. So when's the ExpressCard version coming, guys?